Last week I promised leopards for this week, and did they ever deliver! As the weather gets more unpredictable, the days mixed with thunderstorms and summer sunshine, the bush is getting greener and the variety of creatures big and small grows. We had a few truly memorable cat sightings and a highlight for me was discovering some very small hyenas. Enjoy this Week in Pictures! 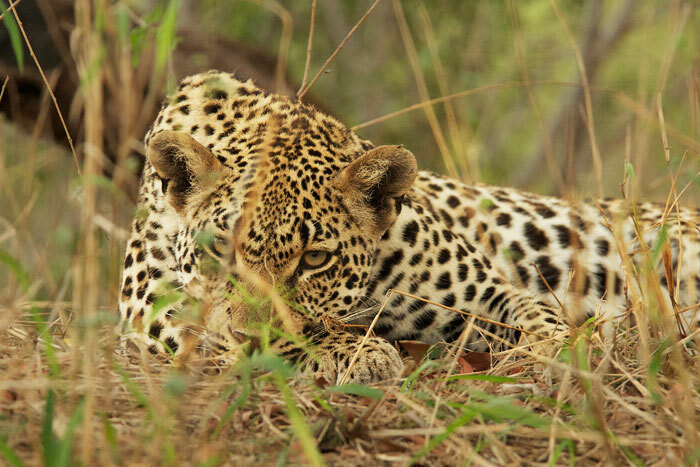 The Maxabene 3:2 Young Male lazily glances at us as he rests in the shade with a full belly. 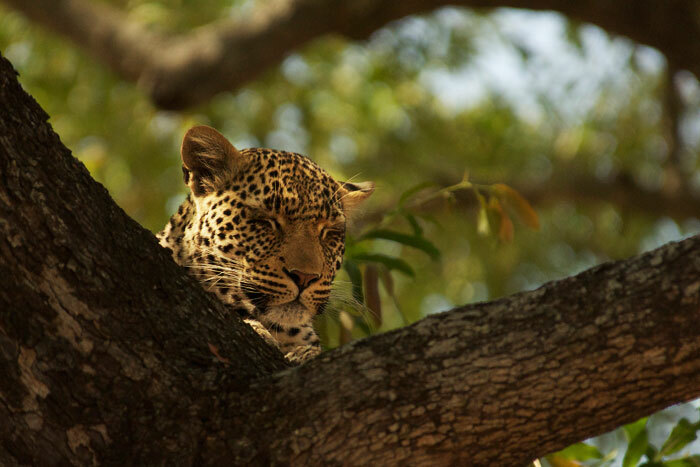 We found him after he had a drink at a nearby waterhole, and followed him back to the base of a Marula tree in which he had hoisted an impala. His eye is looking much better, and his condition has greatly improved in the past few weeks. 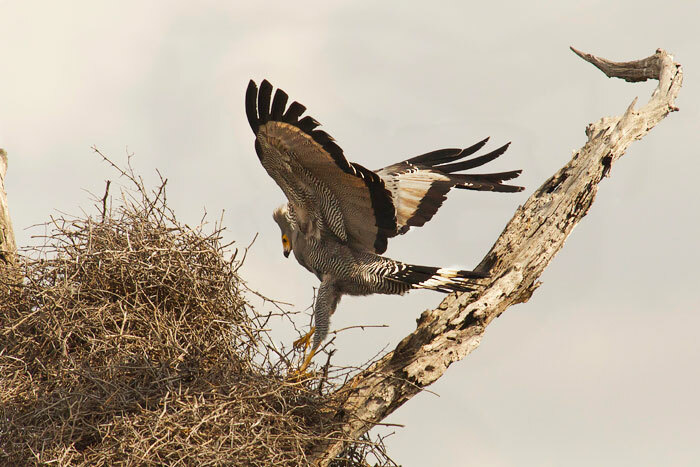 A Gymnogene or African Harrier Hawk tries to tear apart a buffalo weaver nest in order to steal the chicks. Interestingly, it was an African Darter who flew up and tried to chase the predator away. Most likely the Darter was using the nest to house its own brood. The Gymnogene flew away hungry. 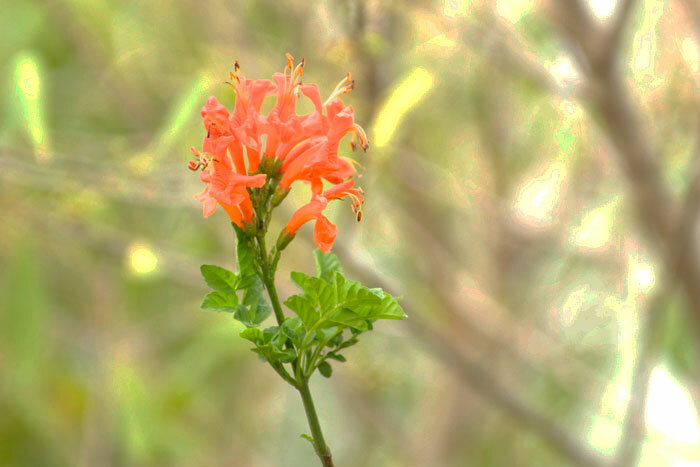 This week in the bush brought a few blossoms, including this honeysuckle in the Tugwaan drainage. 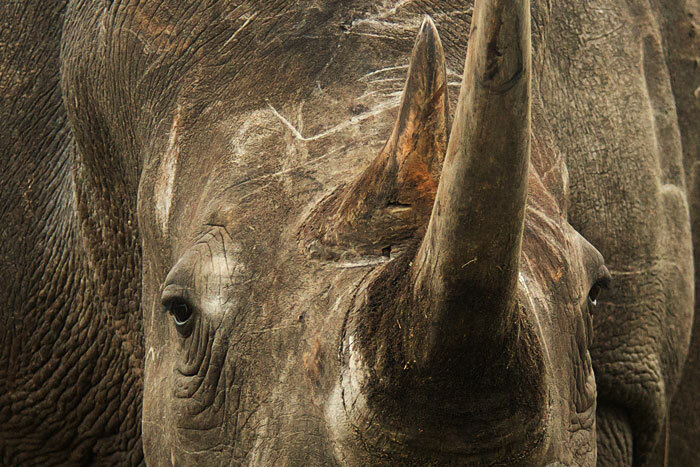 Rhino are often used as a symbol of strength, durability, and aggression. In my opinion, however, they are gentle pacifists who are only dangerous when provoked. This cow and four other individuals grazed quietly around us within arms length, pausing occasionally to listen and smell curiously. Their naive trust in us was touching, but it is heartbreaking to think that they might have the same trust in the poachers that seek to harm them. 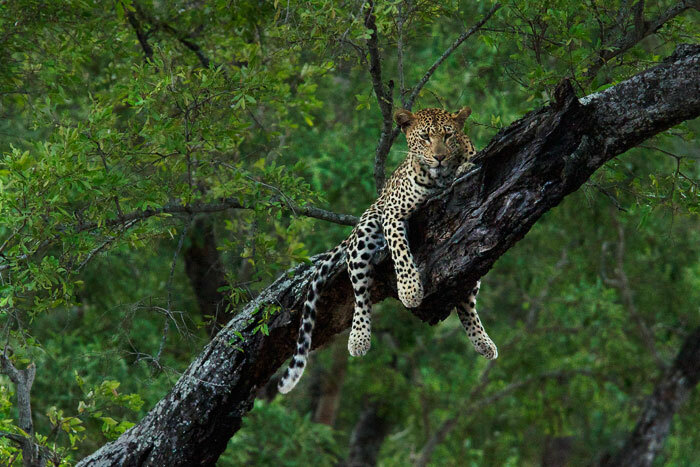 The Vomba Young Female relaxes in an ebony tree. 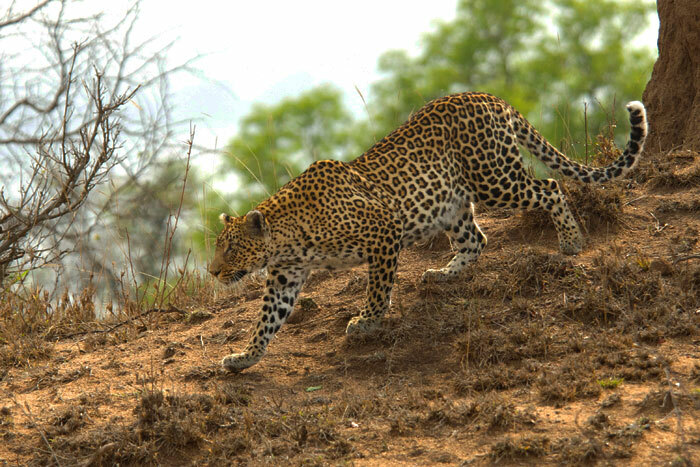 We had a few sightings of this beautiful female around the Sand River this week. Generally the leopard we view in this area only go into trees if they have a kill, but we had three separate sightings this week like this, where the leopard was merely using the tree as a resting spot. 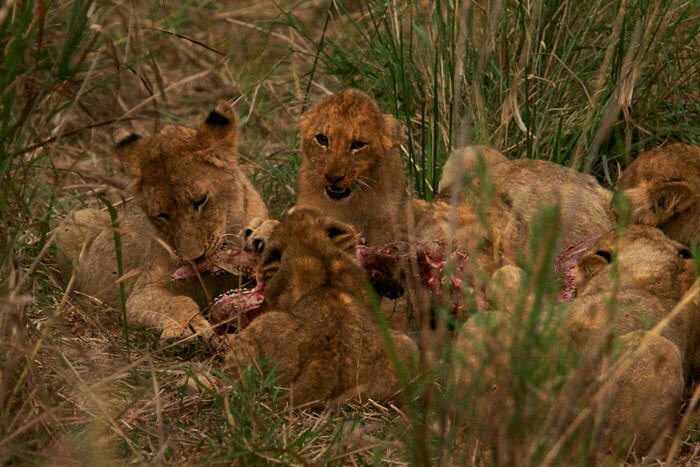 The Tsalala cubs feed on the remainder of a nyala kill. Even at this young age, they are extremely competitive, and the fight over these scraps involved lots of growling, biting, and smacking of one another! The Short Tail Male, aka Shorty or the Tugwaan Male, made a return appearance to Londolozi this week. 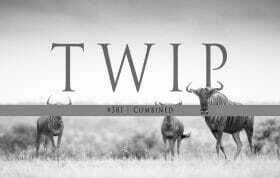 He was viewed with a nyala kill in a tree, but after he finished he made a territorial walk across Nyamakunze Crest. 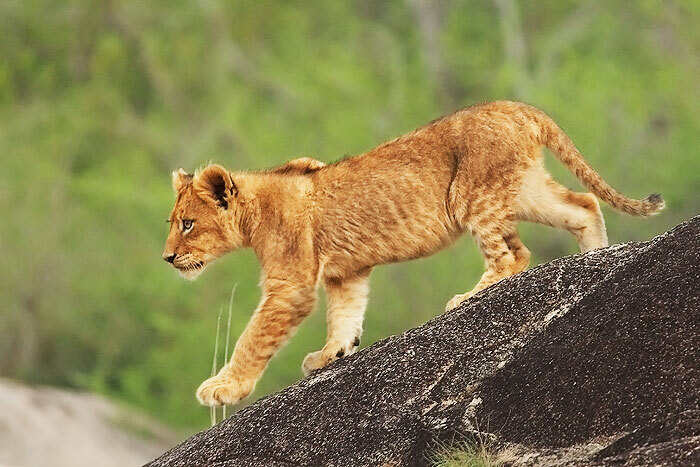 He scent-marked and made quite a few territorial calls, having come across tracks of the Camp Pan Male. 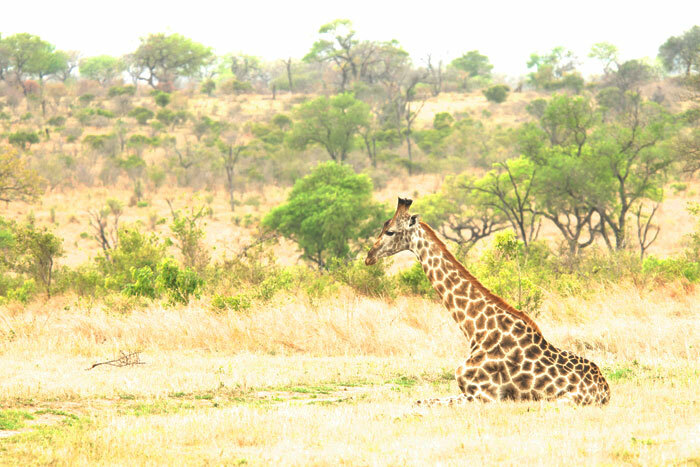 After a light rain, a giraffe rests while ruminating. Giraffe require surprisingly little sleep - only less than two hours a day - but when lying down like this are not sleeping but rather resting as they 'chew the cud'. 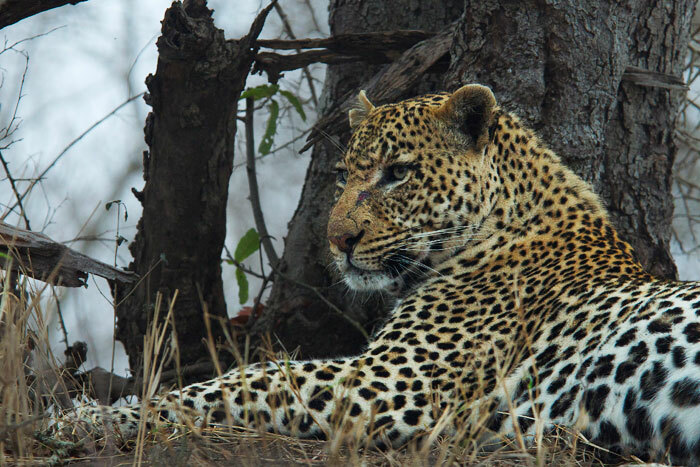 The Marthly Male sits atop a termite mound, clearly displaying his identifying features: his 'mane' on the back of his neck, his torn right ear and his scarred face, even fresh with a new gash. He is a true fighter, and here he confidently posed with an impala kill on the ground behind him, seemingly not worried about predators trying to steal from him. 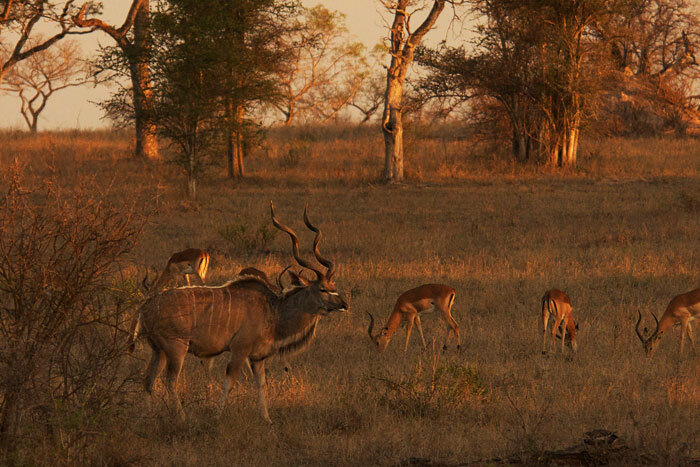 An evening scene on Winnis' clearing, with an impressive kudu bull joining a herd of impala. 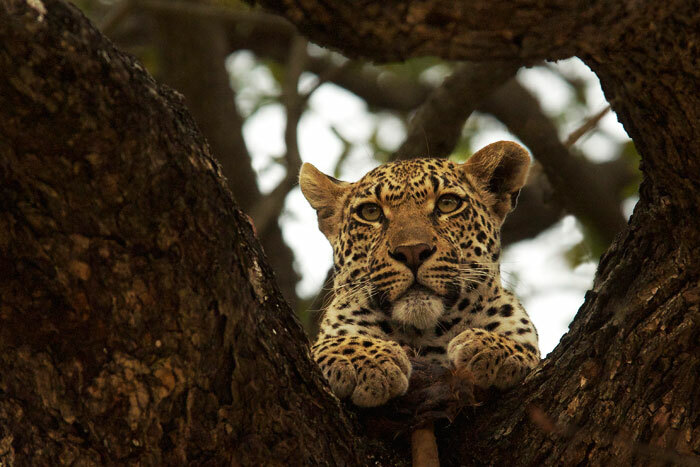 The Nyeleti Young Female rests in a jackalberry tree. When driving close to the river one afternoon, a pair of Burchell's glossy starlings captured our attention by alarming and dive-bombing in the tall grass. The target was this Black Mamba, one of the most dangerous snakes in the world. 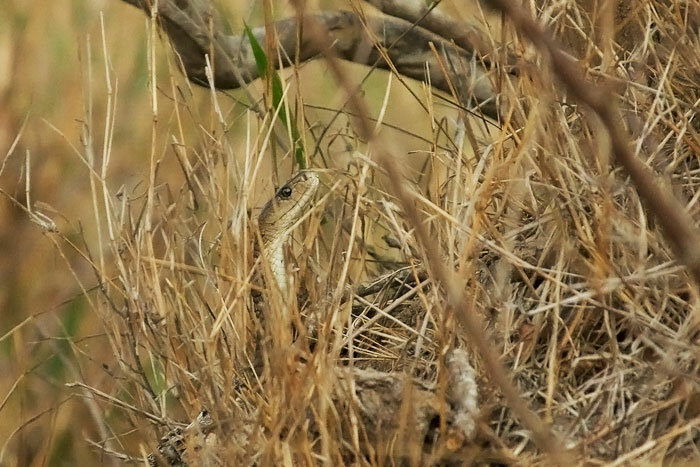 The Mamba appeared to be after their eggs, but slithered away after being repeatedly pecked on the head. 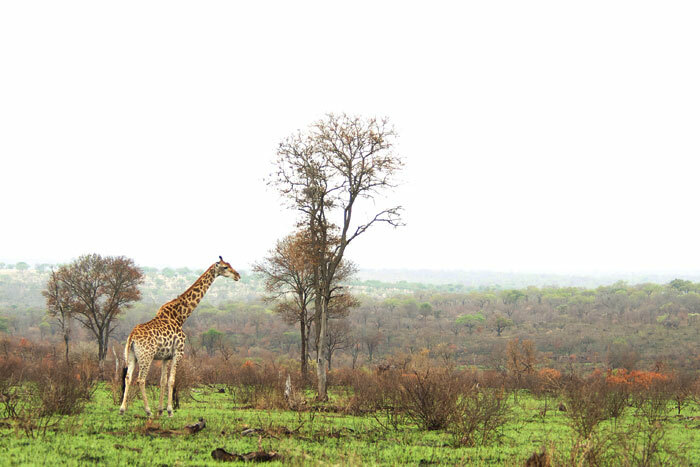 On a misty morning after the rain, a giraffe stares across Munghen. The mix of the burned vegetation and the new greenflush created some brilliant landscape colours this week. Vomba stalks impala from a termite mound. 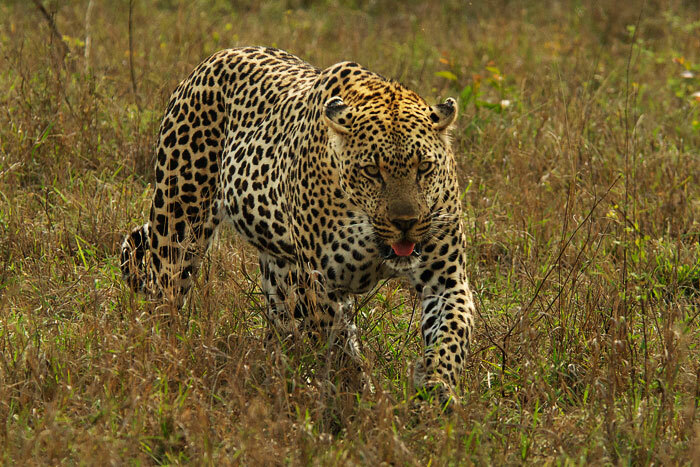 This leopard continues to impress me the more we see her. She always seem to know when to go for the hunt, and has infallible patience. She also has a casual way of keeping her cool when her prey detect her. Here, despite an impala snorting at the feeling of something lurking, she kept so still downwind in the tall grass that he seemed to doubt himself, turned around to feed, and she went in for the kill. 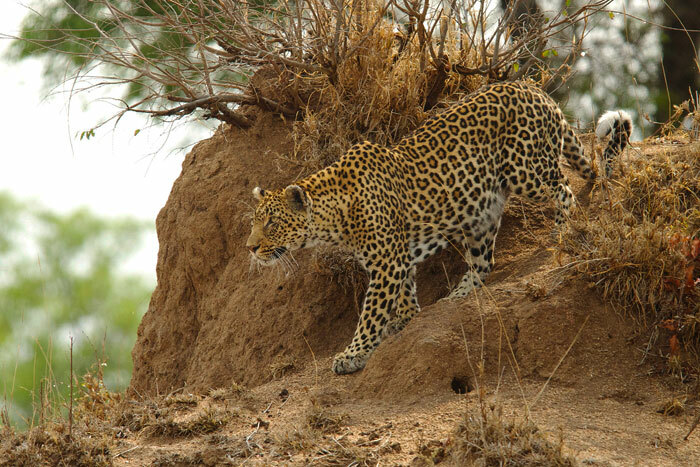 The Vomba Female trots down a termite mound in a crouched position towards a herd of impala. We thought for sure they would see her out in the open, but she lined herself up so perfectly with the surrounding vegetation that they never saw her coming. 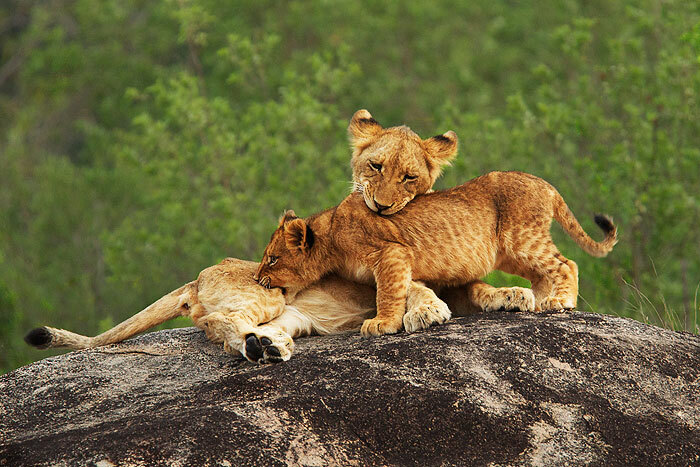 The younger Tsalala cubs try to nurse from their mother. 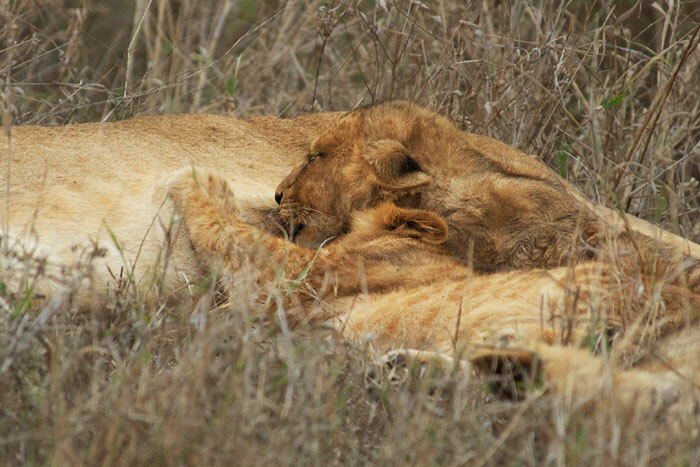 I believe this will be one of the last times we see them nursing, as they are getting to the typical weaning age of lions, and it seemed in this sighting that they were looking rather lean and also struggling to get milk. Luckily for them their mother and aunt are expert hunters! 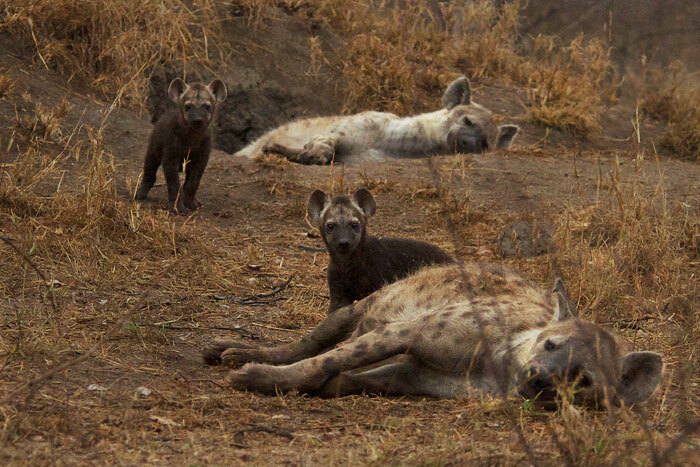 The most exciting moment of the week for me was the discovery of a newly active hyena densite. There are four youngsters, from two separate litters, appearing to be roughly the same age. 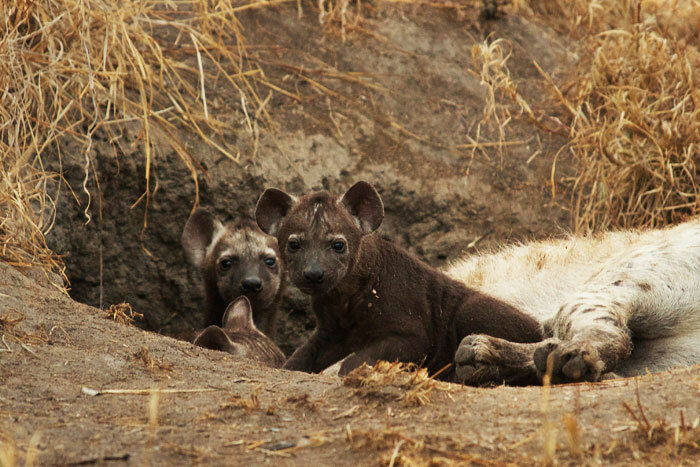 Hyenas have an innate curiosity, and even though this was the first time they had seen a vehicle, came out of their den to see us. Two of them came towards us curiously, albeit still behind their mother. 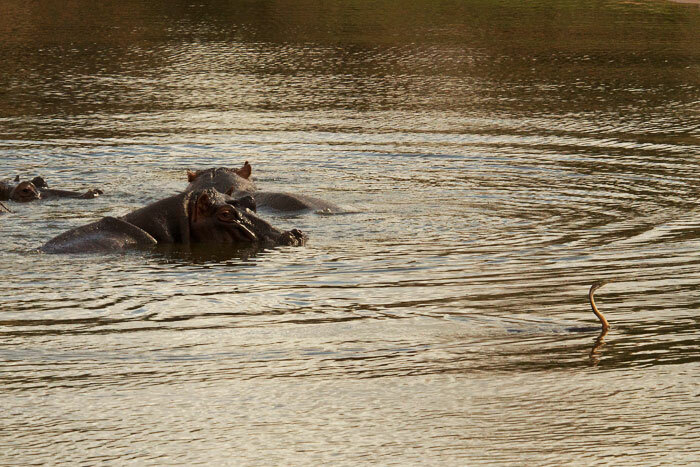 A hippo gets surprised by an African darter swimming by - one can see why it is nicknamed the 'snake bird'. We had a number of memorable predator sightings this week. 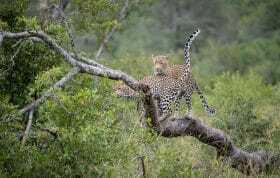 One of them was the Vomba Young Female feeding on a hoisted duiker carcass. 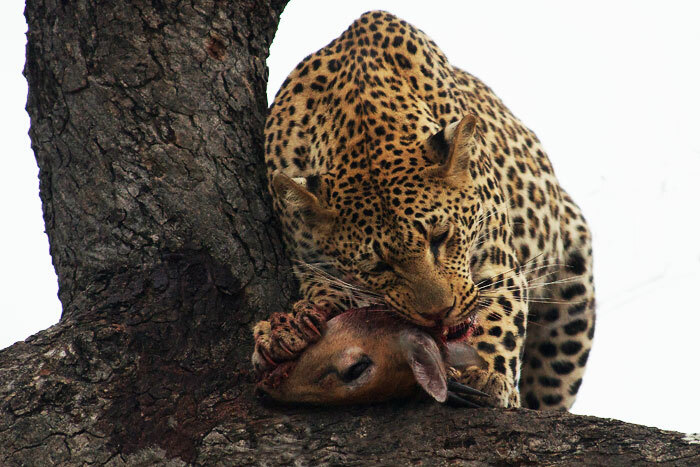 We watched her in a Marula tree feeding and moving the carcass around, and she seemed to be saving the head for last. Meanwhile, a hyena had come to linger below. 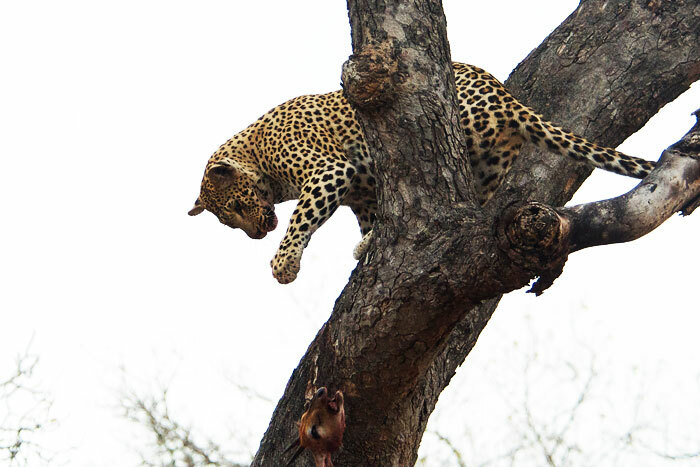 Keeping balance as well as securing the carcass is challenging for all leopards as they move through a tree, but the Vomba Young Female seemed a bit too careless as she moved the remaining piece of meat. She lost her grip and it fell to the ground. 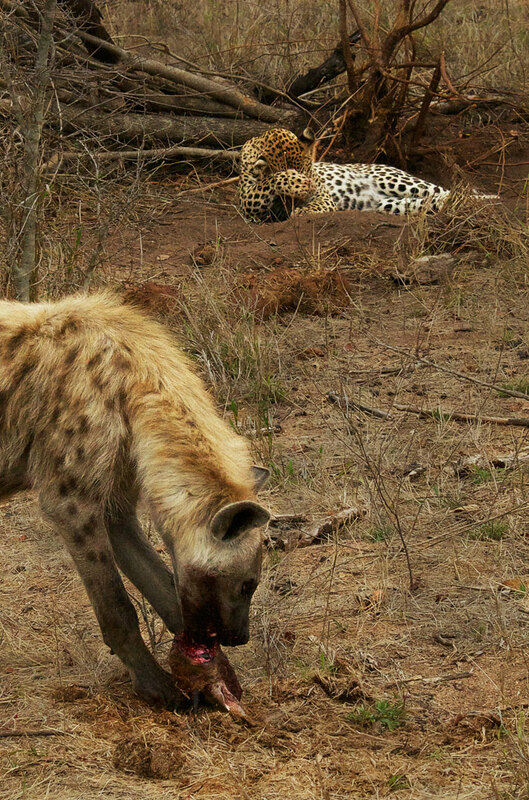 The hyena below grabbed the head and started feeding, while Vomba Young Female descended from the tree, seemingly unable to watch her prize being consumed! 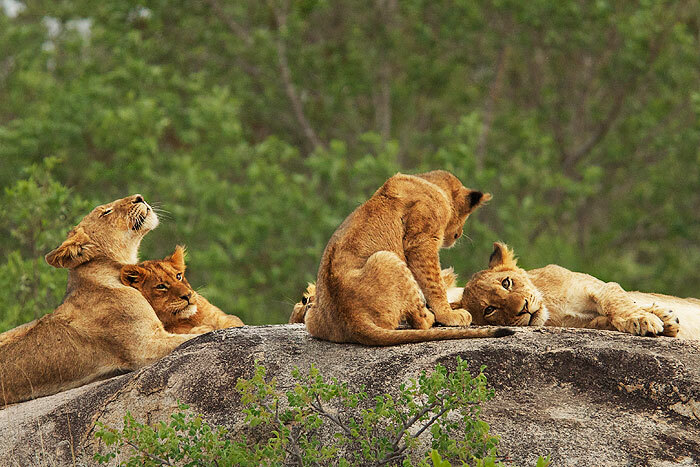 Another lovely sighting was of the six Tsalala cubs on the rocks in the river in front of Tree Camp. The two young males were of course the most restless of the group as they waited for their mothers to return from hunting. Boys will be boys. The younger male even ventured down into the river, but ran back up to the others soon after. We were also fortunate to bump into the Dudley Riverbank 3:3 Young Male whilst following a herd of elephants. 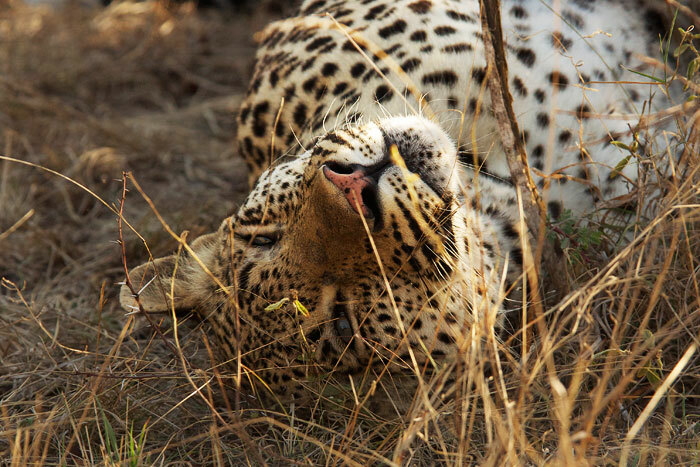 Here he was lying next to a huge jackalberry tree, and we later discovered he had the remains of a duiker kill hoisted above. 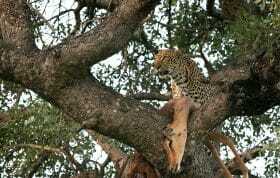 He then obliged our wishes by climbing up the tree and feeding on the kill. However, he seemed to be more savouring the moment... this youngster is still inexperienced so it is an accomplishment for him to have successfully killed and hoisted a meal. Thanks Tom, there has been a new adventure every time we go there… they are still going strong though! Another fabulous week in pictures Talley! I have never seen a giraffe resting! Another notch in my African education! Thanks Janie, I learn something new every day out there! That Gymnogene photo is absolutely glorious, as are all the rest for that matter. What fascinates me every week is not the quality of the pictures, I have no doubt in your teams amazing photography skills, the the beauty of the actual sightings themselves. We have a beautiful world, and the bush is the most beautiful place of all. Thanks for sharing your piece of heaven with me. Thanks Penny, that gymnogene has been seen quite frequently close to camp and because they are so agile in trees, always provides great sightings. You’re absolutely right about us being so lucky to be in this piece of heaven! You know I’m loving the pictures of Shayne and his siblings! That’s not to say the rest of the photos are absolutely spectacular!!! Still wish I were there, but this is the next best thing. We wish you were still here too. They really are getting so big, you would love to see them. 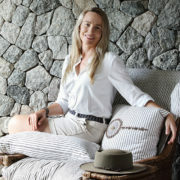 Thanks Sonja, I must admit, seeing them in person is an incredible experience and we hope you come visit us! Why do I tormet myself daily looking at these magnificent shots. 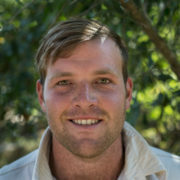 I so wnat to be back at Londolozi! We will be waiting for you when you can come back, Judy! Awesome as usual! Just got back from South Africa….and yet if someone said are you ready to go back…I would be packed! It looks like you had such a lovely time, Debra; I’m so glad you’re hooked on South Africa! Thanks so much for your answers! I love this Blog. Oh Talley, such amazing pictures. I want to come back to SA . . .
Don’t worry Marge it’s been planned for you… Bond/Cook/Pearce-Batten party provisional for next year! Talley these images are lovely, thank you. Please send a squeeze to Freddy. Thanks James, he will really appreciate it…. ‘My friend James’ features prominently in many of Fred’s amazing stories.